Review by AllTheBestFights.com: 2016-09-10, nice toe-to-toe fight between Jesus Soto Karass and Yoshihiro Kamegai: it gets three stars. Jesus Soto Karass entered this fight with a pro boxing record of 28-10-4 (18 knockouts) and he is ranked as the No.60 super welterweight in the world while his opponent, Yoshihiro Kamegai, has an official record of 26-3-2 (23 KOs=88%) and he entered as the No.56 in the same weight class. 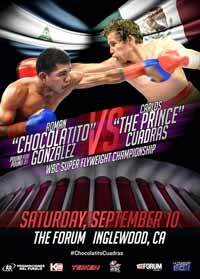 Their first and previous bout ended in a draw (April 15, 2016, Soto Karass vs Kamegai I ); this second fight is on the undercard of Carlos Cuadras vs Roman Gonzalez. Watch the video and rate this fight!